your judgments are like the great deep; man and beast you save, O Lord. Almighty and everlasting God, who governs all things in heaven and on earth, mercifully hear the prayers of Your people and grant us Your peace through all our days; through Jesus Christ, Your Son, our Lord, who lives and reigns with You and the Holy Spirit, one God, now and forever. 6May you see your children’s children! 4Now there are varieties of gifts, but the same Spirit; 5and there are varieties of service, but the same Lord; 6and there are varieties of activities, but it is the same God who empowers them all in everyone. 7To each is given the manifestation of the Spirit for the common good. 8To one is given through the Spirit the utterance of wisdom, and to another the utterance of knowledge according to the same Spirit, 9to another faith by the same Spirit, to another gifts of healing by the one Spirit, 10to another the working of miracles, to another prophecy, to another the ability to distinguish between spirits, to another various kinds of tongues, to another the interpretation of tongues. 11All these are empowered by one and the same Spirit, who apportions to each one individually as he wills. 6Now there were six stone water jars there for the Jewish rites of purification, each holding twenty or thirty gallons. 7Jesus said to the servants, “Fill the jars with water.” And they filled them up to the brim. 8And he said to them, “Now draw some out and take it to the master of the feast.” So they took it. 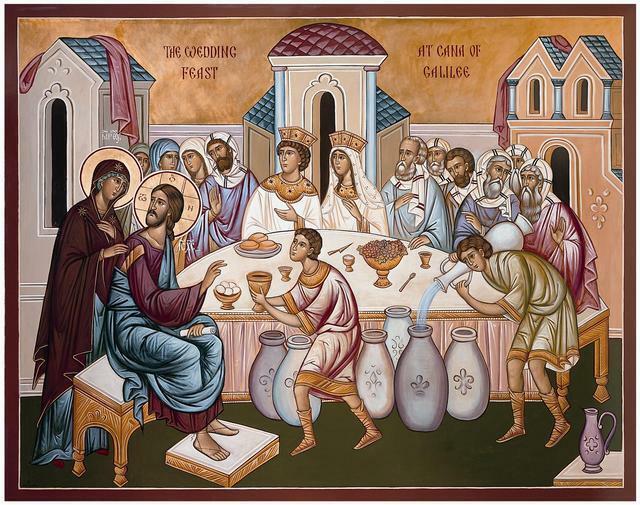 9When the master of the feast tasted the water now become wine, and did not know where it came from (though the servants who had drawn the water knew), the master of the feast called the bridegroom 10and said to him, “Everyone serves the good wine first, and when people have drunk freely, then the poor wine. But you have kept the good wine until now.” 11This, the first of his signs, Jesus did at Cana in Galilee, and manifested his glory. And his disciples believed in him.